The Labour Party has an enormous lead amongst 18 to 30 year olds, and as a young activist, I’m proud to see my generation united in the hope of a Labour government. After all, it’s young people who’ve been hardest hit by eight years of austerity, paying for the Tories’ mistakes in power. But to get the Labour government Britain deserves, we need more than the votes of the young. To win, our alternative must appeal to every age bracket. 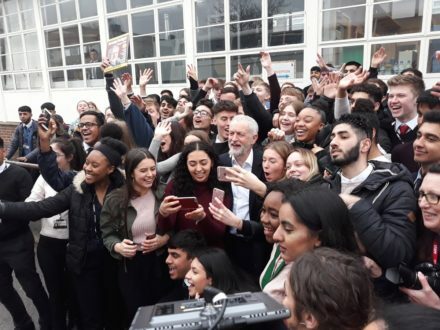 The latest YouGov survey of London voters shows Labour polling at 76 per cent among those aged 18-24, but at just 22 per cent for 65+. Older people turn out the most on polling day, and at the moment they are voting Conservative; we have to change this by building on our success with the young and extending it to every generation. With our ageing population, the ‘grey vote’ has huge power that we need to harness for a Labour victory. At the last election, 65+ voters split 62-25 for the Conservatives, even as we won almost 70 per cent of the 18-25 vote. We need to heal the generational divide and maximise our support with every age group. It’s time we started talking about how our manifesto can improve the lives of older people. Take the health system, for example. Only we will fund the NHS properly and fix the damage done by the Tories. But it’s not enough to talk in these general terms alone: we need to show how we will specifically protect the elderly. This means a focus on social care, a clear explanation as to how our integrated system will work and an end to the fear that millions of older people have about care costs. On transport too, we can build on our successes with the young and go on to win over older voters as well. The recently announced 16-25 bus pass will transform the lives of badly paid young workers, saving them money and making public transport the default for a whole generation. But we won’t be able to deliver that policy without the votes of older people. By building on our promise of investment in the bus network, we can push for the restoration of bus routes lost to local government cutbacks. The shrinking network has isolated many older people from the services they need and by promising to revive them, we can show that Labour will help people of all ages travel freely. Policing is another area where older people have been abandoned by the Tories, and where we can offer a real alternative. Reduced officer numbers have stripped whole neighbourhoods of their police presence, undermining the security of older and vulnerable people and worsening worries about isolation. Our promise to put 10,000 extra police on streets will save the visible patrols that do so much to reassure older people concerned about security. By making the case for well-funded neighbourhood policing, we can win over older voters and ensure no one has to live in fear – regardless of their age. I’m proud that we’re winning over the young with our positive message of hope and progress, investing in Britain and fixing the damage done by eight years of Conservative misrule. But we will only get our chance to deliver our alternative if we win over people who voted for Theresa May in 2017. We had the most popular manifesto at the last general election, and we have the only platform that can rebuild Britain. Our messaging has to reflect that, focusing on winning over the whole population – the many, not the few. If we are serious about helping younger people, we need to win over the elderly. Antony Tucker is a Labour activist in the west Midlands.